If affected salt and other minerals in subsurface caverns are enough to deny a FERC permit, drinking water in the Floridan Aquifer should be, too. 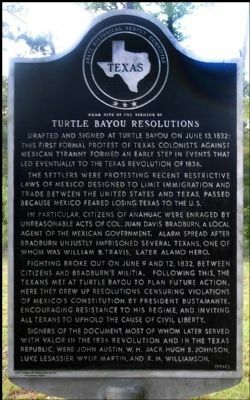 The “first formal protest of Texas colonists against Mexican tyranny” was signed at Turtle Bayou, Chambers County, Texas, where an Alabama Company four years ago wanted to store natural gas underground with an associated pipeline that FERC denied. Communities and local governments throughout the Floridan Aquifer have signed protests against fossil fuel company tyranny in the form of the unnecessary, destructive, and hazardous Sabal Trail fracked methane pipeline. Email FERC Commissioners directly, and it still gets filed as an ecomment, as a Thomas County, Georgia resident demonstrated. And remember FERC could pick Alternative 3 which goes through Thomas County. A FERC comment period ending 15 November 2014 seems to mean Sabal Trail will miss its 31 October formal filing date. No relief suggested for crossing the Withlacoochee River at the border of Brooks and Lowndes Counties, Georgia (or inside Lowndes County next to Valdosta, according to several of the previous alternatives). And every proposed path still crosses the Suwannee River into Suwannee County. Maybe that’s because the Dougherty County Commission and the Albany City Council actually stood up for their citizens, as did Gilchrist County (see Wacassassa Flats Alternative), while the Suwannee County Commission swallowed Sabal Trail disinformation and the Lowndes County Commission and the Valdosta City Council did little (except one letter from the Chairman) or nothing (except one letter from one Council member). There’s still time for Dougherty, Lowndes, and all the other counties and cities to pass ordinances, and to lobby state and federal agencies and elected and appointed officials. Oh, and there’s an election going on. Also no mention of Sabal Trail’s Jasper, Florida Open House, 5-7:30 Tuesday 21 October 2014, but STT’s newspaper notice said the public is invited, so y’all come! Filed with FERC today, 15 October 2014, Supplemental Notice of Intent to Prepare an Environment Impact Statement for the Planned Southeast Market Pipeline Project and Request for Comments on Environmental Issues etc. re Sabal Trail Transmission, LLC under PF14-1. A foreign company wanting to take local resources and not even provide any local jobs, only in “preliminary stages”: sound familiar? 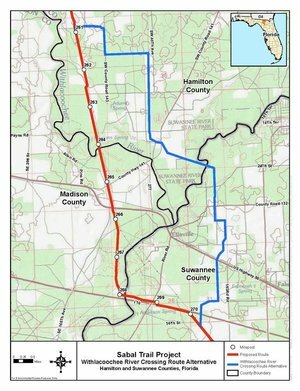 Swiss company Nestlé used the same playbook to try to grab water from the Wacissa River that Houston company Spectra Energy is trying to gouge its hundred-foot right of way for its yard-wide fracked methane pipeline through Alabama, Georgia, and Florida. Wacissa and Jefferson County, Florida fought back and won. Counties can do the same to stop that pipeline. Filed with FERC 18 April 2014. Avoid karst limestone, unconfined aquifer, caves, springs, wetlands, drilling under rivers, blasting, or using groundwater for testing pipes or disposing of it afterwards, and where can a pipeline go? An ally takes action against the methane pipeline and for clean water and springs. Food & Water Watch today posted Stop the proposed natural gas highway near Florida’s Springs: Tell Florida lawmakers to keep our springs safe! 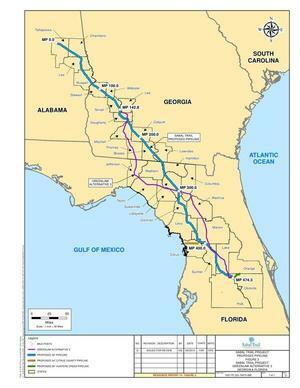 The Sabal Trail is a proposed pipeline that would run from Alabama to Florida carrying natural gas extracted through fracking. Experts fear that this pipeline will endanger our water resources as well as senstive ecosystems in Florida, like our precious springs. The pipeline will also encourage more hydraulic fracking or “fracking.” Fracking is a type of gas drilling that injects millions of gallons of hydraulic fluids — a mixture of chemicals, water and sand — into a well to create pressure that cracks open rock underground, releasing natural gas. This process can deplete and contaminate local water, damage the environment and threaten public health. Please follow the link and sign!